No, and no, not because the bunt is probably a stupid play and not because if you’re Joe Girardi you’re not a manager anymore. 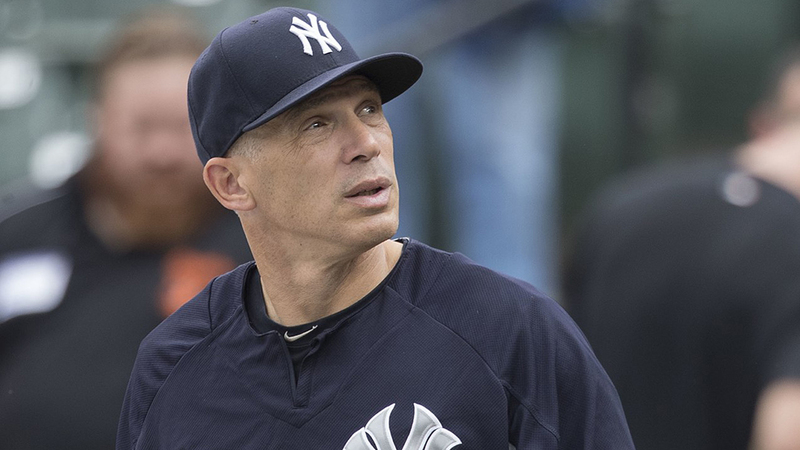 Because you’re not Joe Girardi. And you never will be. I hereby propose–no, decree–a ban. If I’m in charge of baseball announcing (and we can all agree I should be) that syntactical construction is not to be used again. This order takes effect immediately after I finish writing this thing. You know how some big oil company will spill a zillion gallons of crude in the water and plead not guilty and pay a big fine and still say it didn’t do it but promise never to do it again? Okay, if I’m Rob Manfred, I continue to insist the ball wasn’t juiced and I unjuice it already. If I’m an umpire “in New York” and I can’t tell in 30 seconds that the umps on the field were wrong, the call stands. Replay is to avoid egregious injustices, not for microscopic particulate analysis. Play ball! If I’m a National League manager, I make my pitchers watch video of Zach Davies laying down a sacrifice bunt. Yeah, even old-school me realizes the sac bunt is usually nonstrategic. But if it’s such a dumb play, why do I see so many pitchers trying it, then trudging back to the dugout after incurring strike three with a motion akin to poking a snake with a stick? If you’re going to do it, do it right! Mr. Davies pitched 191 innings last season, ninth highest in the National League, and stuck around games long enough for 17 wins (sorry, old school again) in part because he wasn’t a total loss with a bat: He led the league with 14 sac bunts. If I’m supervisor of umpires, I get them all together, lock the doors, ration the doughnuts and coffee, and keep them there until we all agree how high and how low constitutes a strike. Look, human beings are going to make mistakes–it’s a tough job to assess the location of a pitch that takes a fraction of a second to get there. But why do we acknowledge that one ump has a high strike zone, one guy a low one, and just tolerate that? If I’m the Cubs, I declare that the seventh-inning stretch ends with the words “Let’s get some runs!” and I scrap the irritating, distracting TV celebrity interviews that take up the bottom of the seventh when viewers are interested in getting some runs! If they can’t get a basketball coach or a night club singer to do an off-key “Take Me Out to the Ball Game” without promising a half inning of pandering and praise, they can get another song leader who’s looking for a TV moment. If I’m the Twins and Indians, individually and corporately, I donate every penny of proceeds from my two-game April series in San Juan to hurricane relief for the people of Puerto Rico. And while I’m giving away other people’s money, if I’m one of the 29 teams–all 29 teams–not named the Oakland A’s, I follow their lead and find a reason some year soon to make one game free for all fans. The A’s are doing this as part of their 50th anniversary celebration. What a fine way to celebrate a special occasion—and your fans. If I’m Major League Baseball and the Players Association, I agree when we meet this month that we’ll enforce the pace of play rules we settled on three years ago. Those rules are not so drastic that they’re going to get anyone winded, and they won’t turn our leisurely Grand Old Game into ice hockey. And while we’re still on the subject, if I’m on the MLB Rules Committee, I mandate no more than one visit to the mound per hitter, either a player from the field or a representative of management from the dugout, but not both, eliminating the one-minute stall so the man in the bullpen can throw some more warmups. And if I’m a real radical on the Rules Committee, I propose that a reliever must pitch to at least two batters before being replaced mid-inning. If I’m Adrian Gonzalez or Matt Kemp, I wonder how I went from being a Los Angeles star to persona non wanted in just a couple of short years. If I’m ESPN, I’m hinting to the powers that are that it sure would be promotable TV if the Angels named Shohei Ohtani the starter against Aaron Judge and the Yankees on my network’s Sunday Night Baseball telecast from Anaheim on April 29. While we’re on the subject: If I’m Yahoo, I’m ashamed of myself for admitting that I can’t be bothered to adjust my fantasy software to accommodate Ohtani owners by letting both his pitching and batting stats count, instead declaring that he’s two separate people. Wanna trade Ohtani for Ohtani? Full disclosure: Ah, you can guess. If I’m in charge of World Series scheduling, I start the games at least an hour earlier. Better that the West Coast misses the first few innings than the rest of us have to go to bed and miss the finish. If I’m a fan in Florida, I get my tickets early for what looks like a season of great baseball. Yes, I’m serious. No, I didn’t say anything about the Marlins or Rays. Preseason No. 1 Florida, the defending NCAA champion, opens at home Feb. 16, as does No. 20 Miami. No. 4 Florida State starts later in the month. If I’m you, dear reader, I share my if-I’m wishes in the comments. If I’m Scott Boras, I’m reminding various teams that I have compromising pictures of them so we can get this off-season started already. We hereby declare all teams shall not use (intended to be cute) tacky special uniforms dedicated to causes/holidays/special people other than their own team. No need to promote anything/everything anymore. Play ball, get dirty. Win games. If I am an announcer, I will stop using the word “unbelievable.” That word is reserved for plays when an alien spaceship lands on the mound and kidnaps the pitcher. Or when a game in DC is postponed in mid August due to 6 inches of snow. But not when someone swings and misses three times at a 100 mph fastball. If I’m in charge, I pool all MLB revenue and distribute it equally amongst the 30 teams, a la the NFL. Someday NYY and LAD will be forced to realize that they cant make all that money without 28 other competitive teams. No more have’s and have not’s in game already run by billionaires. if i am commissioner manfred, i put in a pitch clock that is no more than 10 seconds; which was the average time for a pitch to be thrown in the mid 1980s…baseball needs to believe that a pitcher cannot think for himself, that a manager or coach needs to call every pitch, relay that pitch to the catcher, and have the catcher walk to the mound to verbally tell the pitcher behind the mask of his catchers glove so no one else can hear what the pitch is…when did pitchers become so dumb?